Robin Hood coupon is a printable coupon available at SmartSource.ca. This is a hidden coupon so you can’t find the coupon directly on SmartSource.ca’s website. Visit here to see a list of hidden SmartSource coupons and click on the Robin Hood coupon. Print off the coupon and bring it into any supermarket to save money on your groceries. 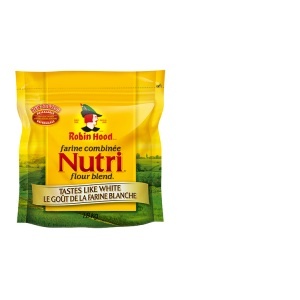 Robin Hood Coupon is to Save $1 on any Robin Hood Nutri Flour Blend. Robin Hood coupon is valid only in Canada. You can find Robin Hood Nutri Flour Blend in any supermarket, grocery stores, Walmart and more. This coupon will work for all varieties including Tastes Like White, Omega-3 & Fibre, and Gluten Free. Easily add goodness while making your baked goods taste great with a flour blend that also has a source of fibre. A blend of whole wheat flour and flax seeds. It bakes up deliciously and has a high source of fibre and a source of Omega-3 polyunsaturates.A gluten free flour blend with a source of fibre, helping you to add goodness while making all of your favourite recipes taste delicious. Baking is delicious and nutritious with Robin Hood® Nutri™ Flour Blend. This all-purpose flour is a blend of unbleached flour and ground wheat bran. It tastes like white flour, it provides the same amount of fibre as whole wheat flour and bakes up light and golden! SubstituteNutri™ Flour Blend for white flour in any of your favourite recipes, or try one of our new Nutri™ Flour Blend recipes.